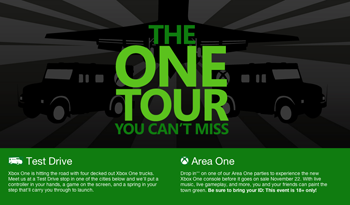 Microsoft's "Area One" tour and "Test Drive" roadshow will travel to 13 cities from the United States to England, beginning this week and ending around the Xbox One's launch. Beginning October 3, Microsoft will be offering free demos for anyone 18 years or older to the Xbox One before it launches. "Area One" parties will have music and live gameplay, and they are available in select cities for a few days at a select location. Space is limited, so Microsoft has also set up a "Test Drive" roadshow, which will travel to both the same cities hosting "Area One" parties and cities without them. The first city in the tour is Philadelphia from Oct. 3-6. If participants are unable to attend, Xbox One trucks will be in the city from Oct. 25-28 at universities and the Lincoln Financial Field. Other cities included in "Area One" are Paris (Oct. 10-13), Toronto (Oct. 10-13), Chicago, (Oct. 17-20), Vienna (Oct. 17-20), Atlanta (Oct. 24-27), Dallas (Oct. 31- Nov. 3), Berlin (Oct. 31-Nov. 3), Phoenix (Nov. 7-10), San Francisco (Nov. 14-17), Dublin (Nov. 14-17), Los Angeles (Nov. 21), and the final stop will be in London (Nov. 21-24). The Xbox One will also be at the Milan Games Week (Oct. 25-27), Paris Games Week (Oct. 30-Nov. 3), and the Madrid Games Week (Nov. 7-10). The Xbox One launches on Nov. 22. If you want to give the next-gen console a test before committing to buying it, one of these events might be for you.